Preheat the oven to 375. Wash, dry, and core the apples, leaving the bottom intact to hold in the maple syrup. You should have a hollow space in the apple roughly 1 inch across and 1 1/2 inch deep, more or less. Score the sides of the apples with small incisions in the skin. This will help the apple keep its shape in the baking. Save the apple tops if you wish. In a small bowl, mix the apple juice and 2 Tbsp of the maple syrup. Place aside. Toast the walnuts for about 5 minutes in a pan over medium heat, stirring often to ensure they don’t burn. Remove from heat and cool. In a medium bowl, mix the remaining maple syrup, chopped walnuts, and spices. Place 1/4 Tbsp butter at the bottom of the hollow in each apple. Top with walnuts and maple syrup mixture until it reaches the top of each apple. 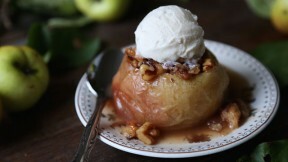 Place the apples in a small lidded oven-proof baking pan or Dutch Oven. Pour the apple juice and syrup mixture around the apples, to pool at the bottom of the pan. If you saved the apple tops, place these next to the apples, in the juice mixture. Put a lid on the pan and bake in a 375F oven for about 30 to 40 minutes or until the apples are completely tender. Be sure not to over-bake them or they may lose their shape and fall apart. Still delicious, but not the best presentation-wise. Serve hot or cold, with vanilla ice cream, whipped cream, or thick yogurt.